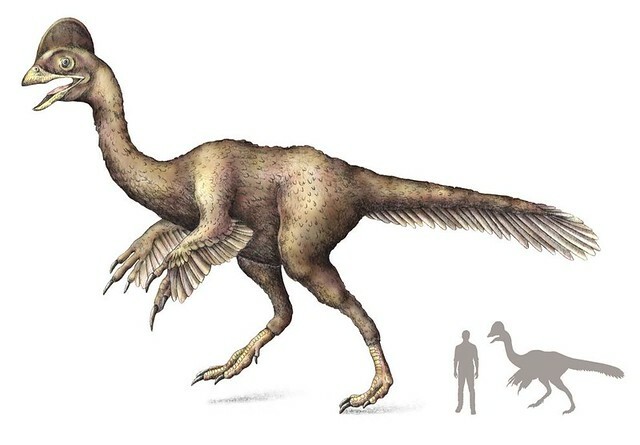 A newly discovered dinosaur species that paleontologists have dubbed the “chicken from hell” is among the largest feathered dinosaurs ever found in North America. The 11-foot-long (3-meter-long), 500-pound (225-kilogram) Anzu wylieiis an oviraptorosaur—a family of two-legged, birdlike dinosaurs found in Central Asia and North America. These dinosaurs ranged in size from a few pounds to over a metric ton, according to a study published March 19 in the journal PLOS ONE. With its toothless beak, long legs, huge feet, and claw-tipped arms, A. wyliei looked like a devilish version of the modern cassowary, a large ground bird found in Australia. The dinosaur’s well-preserved skeletons suggest it was a wide-ranging eater, munching on a variety of vegetation and perhaps small animals. * Song title and lyric by Alex Kramer and Joan Whitney; recorded in 1946 by Louis Jordan and His Tympany Five. As we rethink those chicken wings, we might spare a thought for Raymond Cecil Moore; he died on this date in 1974. A geologist and paleontologist, Moore did pioneering work on Paleozoic crinoids, bryozoans, and corals (invertebrate organisms existing 570 to 245 million years ago). Among other things, he showed that fossil stemmed forms, sometimes called “sea lilies,” while they bear a superficial resemblance to flowers, were actually animals. Moore is probably best known as the founder and editor of the landmark multi-volume Treatise of Invertebrate Paleontology. 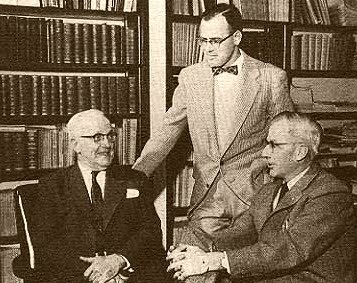 Moore (on left), with William W. Hambleton, and Frank C. Foley.